The United Republic of Tanzania comprises Tanganyika, on the African mainland, and the islands of Zanzibar and Pemba. Tanganyika lies on the east coast of Africa and is bordered by Kenya and Uganda to the north; Rwanda, Burundi and Democratic Republic of the Congo to the west; and Zambia, Malawi and Mozambique to the south. The islands of Zanzibar and Pemba lie off the east coast of Tanganyika. Although Tanzania is a United Republic, uniting Tanganyika and Zanzibar (which is part of an archipelago including Pemba), Zanzibar retained its legislative independence in certain areas, inter alia in intellectual property. So, although the United Republic of Tanzania is a union of the two countries, the IP regime in Tanzania entails two separate and independent legal systems: for purposes of IP regulation, Tanganyika and Zanzibar are two separate jurisdictions. Zanzibar has thus enacted its own IP laws which apply in Zanzibar (and apparently also in Pemba). Therefore, although the IP laws enacted in Tanganyika are formulated as if to apply to the entire United Republic, so that protection obtained under those laws would appear to have effect also in Zanzibar and Pemba, this is in fact not the case. Tanzania, and thus Tanganyika, is a member of the Paris Convention, the ARIPO (Banjul Protocol), the Nice Agreement, and the WTO/TRIPS. Trade mark applications may be filed as national applications, in appropriate circumstances claiming convention priority in terms of the Paris Convention. Although Tanganyika is a member state of ARIPO, it has not enacted enabling legislation for the local recognition and protection of ARIPO trade mark registrations. Provision is made for the registration of trade marks for goods and services. Tanzania, and thus Tanganyika, is a member of the Paris Convention, the PCT, ARIPO (Harare Protocol), and the WTO/TRIPS. 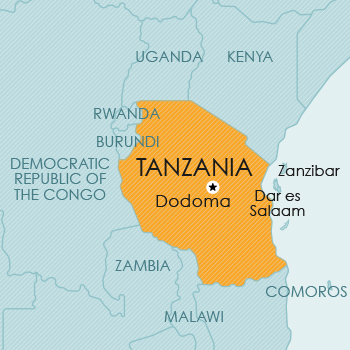 As indicated earlier, the United Republic of Tanzania comprises two countries or regions, ie Tanganyika and Zanzibar. These two regions have separate IP laws. Patent protection must thus be obtained separately in each territory. Patent protection is obtainable in Tanganyika via a national filing or via an ARIPO application designating Tanzania. Tanganyika has recognised the Harare Protocol (which regulates patent and design filings in ARIPO) in its national law. It is likely, therefore, that valid patent protection will be afforded to applicants seeking to obtain a patent via an ARIPO application. The Act also specifically recognises and provides for PCT applications, so that valid protection can be obtained via a PCT national phase application in Tanganyika. Tanzania, and thus Tanganyika, is a member of the Berne Convention and the WTO/TRIPS. illustrations, maps, plans, sketches and three-dimensional works relative to geography, topography, architecture or science. works inspired by expressions of folklore. ideas, procedures, methods of operation, concepts, principles, discoveries or mere data. Tanzania is not a member of the UPOV Convention for the Protection of New Varieties of Plants. Plant breeders’ rights can only be obtained for those varieties of new plants that have been listed under Rule 6 and the second schedule of the Plant Breeders’ Rights Regulations of 2008.